How to watch Parrot Sketch Not Included: Twenty Years of Monty Python (1989) on Netflix Argentina! Sorry, Parrot Sketch Not Included: Twenty Years of Monty Python is not available on Argentine Netflix, but you can unlock it right now in Argentina and start watching! With a few simple steps you can change your Netflix region to a country like South Africa and start watching South African Netflix, which includes Parrot Sketch Not Included: Twenty Years of Monty Python. We'll keep checking Netflix Argentina for Parrot Sketch Not Included: Twenty Years of Monty Python, and this page will be updated with any changes. Parrot Sketch Not Included: Twenty Years of Monty Python is not available in Argentina BUT it can be unlocked and viewed! Presented by Steve Martin, this anthology draws from “Flying Circus” and “Fliegender Zirkus” to mark the 20th anniversary of the TV series. There is a way to watch Parrot Sketch Not Included: Twenty Years of Monty Python in Argentina, even though it isn't currently available on Netflix locally. What you need is a system that lets you change your Netflix country. With a few simple steps you can be watching Parrot Sketch Not Included: Twenty Years of Monty Python and thousands of other titles! 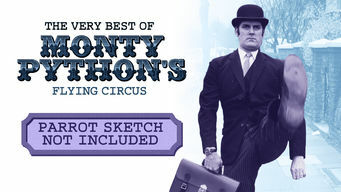 Watch "Parrot Sketch Not Included: Twenty Years of Monty Python"